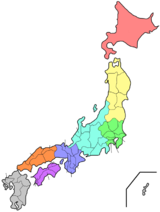 Nara Prefecture (奈良県, Nara-ken) is a prefecture of Japan in the Kansai region on the island of Honshu. The capital city is Nara. The area of Yamato Province was reorganized as Nara Prefecture during the Meiji period. Nara is bordered to the west by Wakayama Prefecture and Osaka Prefecture. Its border on the north meets Kyoto Prefecture. Mie Prefecture is on the east. National Parks are established in about 17% of the total land area of the prefecture. ↑ Nussbaum, Louis-Frédéric. (2005). "Nara-ken" in Japan Encyclopedia, p. 699; "Kansai" at p. 477. ↑ Nussbaum, "Yamato" at p. 1046; "Provinces and prefectures" at p. 780. ↑ Japan Ministry of the Environment, "General overview of area figures for Natural Parks by prefecture"; retrieved 2012-8-30. This page was last changed on 31 August 2017, at 08:34.